Nintendo's homeland, the land of the future finally gets to play Wii and boy are they excited. Japan is somewhat of an oddball market, fans are very loyal for long periods of time but then suddenly switch allegiance. Nintendo have been on the cold side the past 5 years, Gamecube did okay, but the PS2 reigned supreme throughout its life. But today, Nintendo at least, hope that things have changed. The Wii has officially launched in Japan, gamers have been queuing for the past few days to try and get their greasy paws on the new console. Nintendo estimated that there are 400,000 units available for the Japanese launch, with more to follow in the coming weeks. From what we've heard, this is no way near enough to keep up with demand. 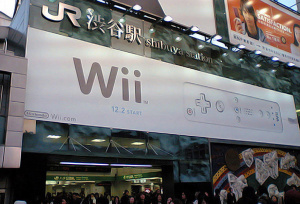 The Japanese interest in Wii has sky rocketed over the past few weeks, even with the PS3 launch the orient have been flocking back to Nintendo. 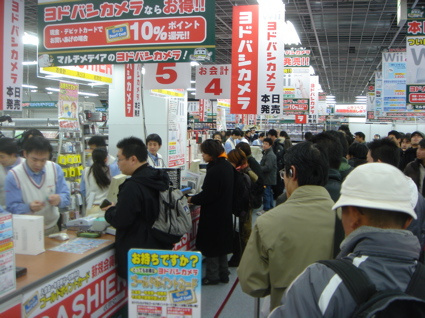 Rumor has it that the entire consoles stock was sold within hours of launch, knowing Japan thats probably spot on true. When the Japanese market want something, they want it bad. We're all hoping that Wii has the sustained market interest that the DS has been enjoying for over a year now. If Nintendo are to return to their rightful throne, Japan is the land to make it happen. Anyway, I'm really going off point, we've also heard that the launch went pretty smoothly and has yet been no recorded fatalities. Different stores used different techniques to dish out the consoles and tried to keep everyone happy. "Numerous methods of retail were used to launch the Wii, and these varied from store to store. Yodobashi kept its customers camped overnight in a parking lot, distributing numbered tickets to determine the order of entrance, before opening its doors at 7am. Bic Camera also opened at 7am, although most of the 650 people in line there didn't arrive until the first trains of the morning began to run at around 5am. 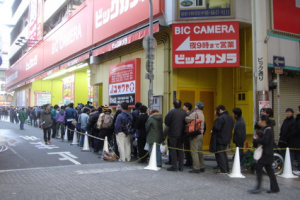 Famitsu reports that the Tokyo Ikebukuro branch of Bic Camera sold out if its allocation of 1,200 units, while the Tokyo Yuuraku-cho arm of Bic Camera declared the console "sold out" at 5.41am when the 1,500th person arrived in the queue there." It's alittle unfair to claim this as the first victory over the PS3, Sony's console only had 100,000 units available at launch in Japan, but still pretty much sold out, even with its hefty price tag. The true challenge is to keep selling vast amounts of Nintendo's latest to the faithful Japanese, that'll really put a spanner in Sony's plans. "What launch title you gonna buy?" I ask him. He's wearing a black puffy coat and a black knit cap. "Zelda." Bringing Zelda as a Wii launch title was a very smart move, even if it is 90% Gamecube. Trust me, it really is that good. Alas, Australians and Europeans, your wait is almost over, a week from now you'll finally be playing Wii, everything in the world will become aligned and it'll be the best holiday season you've had in years. Curiosity of Nintendo. This is going to be another DS-size success, you can just feel it.